I often say in speeches that to my mind the European Union has three major achievements to its credit: (1) ensuring that France and Germany — and by extension the rest of Western Europe — would never go to war again, (2) the re-incorporation of formerly Communist states of central and eastern Europe into the European family after the fall of the Berlin Wall, and (3) the European Single Market. A crucial element of the last-mentioned is freedom of movement for citizens of the EU throughout the now 28-member Union. The mobility of labour in particular has been a great boon to millions of individuals but also to economies, not least Britain’s — and in particular that of London. So it is particularly galling for me to hear the tone of the debate about EU migration in so much of the country, egged on by the more inflammatory elements of the popular Press, UKIP and far too many Conservative MPs, who really ought to know better. As was made abundantly clear at a seminar on Labour Mobility within the EU, hosted this morning by the Polish Ambassador, Witold Sobków, a major part of London’s boom has been the city’s ability to draw in EU migrant labour of all kinds — migrants, incidentally, who recent studies show pay in about 30% more in taxes to the British Exchequer than they take out in services and benefits. The timing of the seminar was pegged to the looming 10th anniversary of the Big Bang enlargement of May 2004, when eight former Communist states (plus Cyprus and Malta) joined the EU. 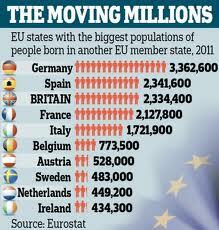 Britain, Ireland and Sweden gave immediate working rights to citizens of the new entrants, unlike the rest of the EU. And although many Brits were taken aback by the large numbers of Poles, in particular, who arrived, skilled and keen to work, speakers at today’s seminar pointed out that Britain benefited. economically from that influx. Various perspectives on the subject were provided by Prof. Christian Dustmann (UCL), Jonathan Portes (National Institute of Economic and Social Research), Tim Finch (Institute for Public Policy Research) and the moderator, Sunder Katwala (British Future), of whom only Tim Finch really tried to be devil’s advocate in putting forward some of the reasons why some people in Britain might be uneasy about having EU migrants in their midst (though there is an almost equally large number of British migrants on the Continent). Migration Watch, which acts as a doomsayer on the subject had unfortunately refused an invitation to send a speaker for the panel. But it was clear that the mood of the audience was very much on the side of the angels (from my point of view), seeing labour migration as essentially positive for Britain. The negative narrative of so much of the media needs to be challenged head-on, and Liberal Democrats, in particular, as the “Party of IN” should not shy away from defending EU migration in the face of the antis myths and scaremongering. This entry was posted on Tuesday, 4th March, 2014 at 11:03 pm	and is filed under Uncategorized. Tagged: Chirstian Dustmann, EU migration, European Single Market, Jonathan Portes, Labour mobiity, Liberal Democrats, Migration Watch, Sunder Katawala, Tim Fitch, UKIP, Witold Sobków. You can follow any responses to this entry through the RSS 2.0 feed. You can leave a response, or trackback from your own site. Surely the percentage of immigrants would be more enlightening than the raw numbers? For instance, the figures in the graphic work out that about 3.6% of the population of UK was born abroad, but the equivalent for Sweden is 5%. Indeed, Frank — and even higher in Belgium.